Choosing the perfect gift for your granddad can sometimes be a head scratcher. After all, what do you get the man who has everything? Besides, if your grandpa is anything like mine, he will always tell you that he does not need anything, so you should not worry about him. Well, Christmas time is a time of giving and family, and there is no way we are going to follow that advice. 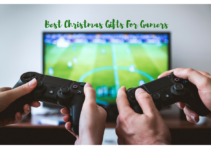 To help you figure out the best Christmas gifts for Grandpa, we have compiled a top ten list for this Christmas season. Whether your grandpa is an avid fisherman or the retiree who is enjoying his twilight years of rest and relaxation, there is a gift out there that will make him crack a smile and make your hunt more than worth the effort. So before you dive into your Christmas shopping, take a moment to stop and consider more carefully exactly what your grandpa might want or need. 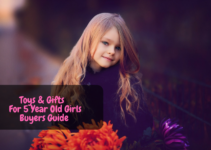 Our short guide and shopping list will give you a good place to start so that you can get your shopping done quick, right, and with as little hassle as possible. What kind of hobbies does he enjoy? Are there any specific activities, books, movies, etc., that he just adores? Just like anyone, there is a good chance that your grandpa would appreciate a gift that fits or otherwise appeals to his interests. Is there a new baby in the family? Or have you (with or without a significant other) recently gone on a vacation or taken family pictures? Consider how the family can play into your granddad’s gift to create something that is truly meaningful and lasting. Often enough, grandfathers are the ones always there to fix a problem (physical or otherwise), offer sound advice based on a long lifetime of experience, and generally spoil his grandkids rotten if given the chance. Your grandpa started a family for a reason, and sharing your part in that family with him is a great way to go when it comes to Christmas. It is also important to keep in mind that most grandparents have reached an age where they will likely no longer be able to enjoy objects or activities that require a greater deal of dexterity to use. Consider your granddad’s overall health and physical ability when choosing a gift for him. Along the same lines, also consider that, with age, our eyesight starts to degenerate, some more severely than others. It would be best not to purchase your grandpa a gift that includes small letters or numbers that he will have to struggle to read. Without offering insult, look for gifts with larger print and buttons that are easier to operate. Keep it simple this Christmas with this personalized coffee mug. 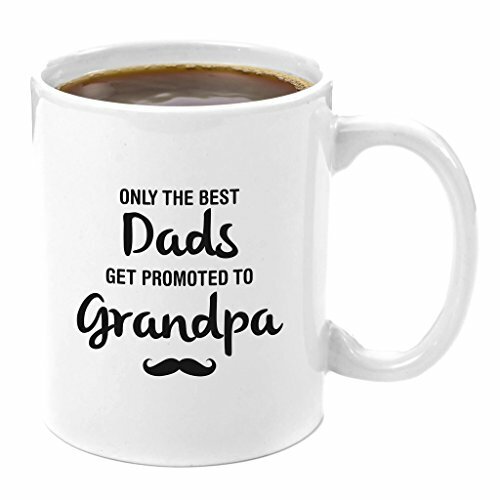 This type of gift is not only a practical and useful item that grandpa can use every morning with his cup of joe (or tea, depending on his tastes) with a cute and loving reminder of just how much he means to your family. Each mug is made from high quality ceramic and perfect for both hot and cold liquids. This type of gift is also highly affordable and can be used year-round, as it is not holiday specific. The mug measures 4.9 x 4.2 x 3.7 inches. Have you and your spouse just had your first child? 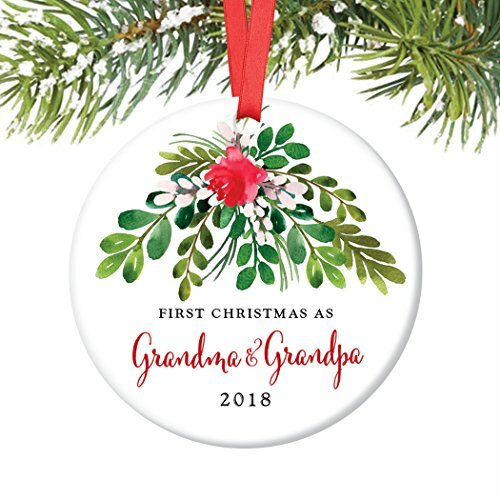 If so, then your granddad might appreciate a heartfelt, personalized ornament that will help him memorialize the birth of his first grandchild this Christmas 2018. The ornament is a 3 inch flat white porcelain circle decorated with a sprig of mistletoe. Below the mistletoe, the phrase “First Christmas as Grandma & Grandpa 2018” is written in a beautiful, neat script. The perfect gift for the grandpa who loves to decorate for the Christmas season. 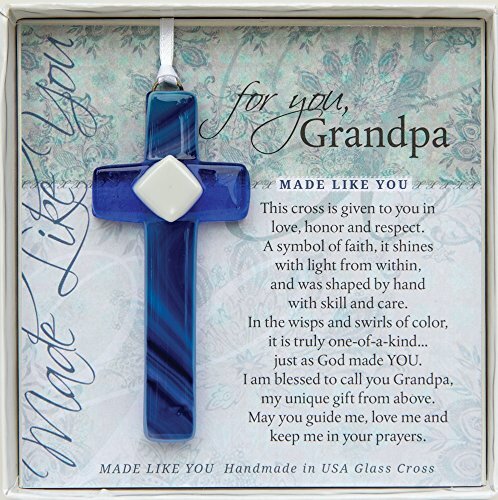 For the more religious granddad, this beautiful handmade blue glass cross is the perfect ornament to gift him this Christmas season. Each cross comes in an adorable gift box with a short, religious saying that ties in your grandpa and shows a deep sense of appreciation for him as he is. Each cross is handmade in the United States and measure 4 inches. Since these crosses are handmade, each one will have its own designs and possible glass imperfections that make every cross a unique and personalized gift. 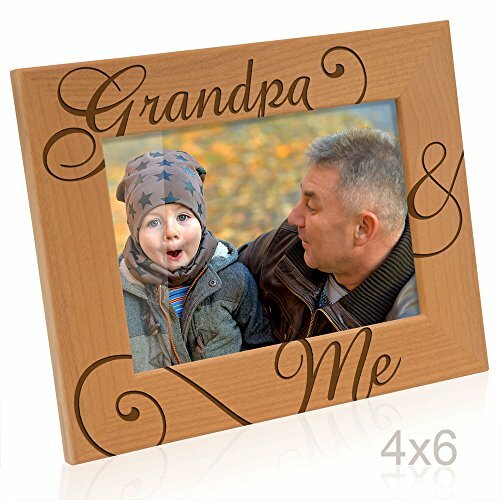 This gorgeous wood picture frame features the phrase “Grandpa & Me” engraved into the frame itself and surrounding the glass window where a picture of you and your granddad can fit (or your dad and child). Each frame is handmade and easy to set up on an end table or hang on the wall. 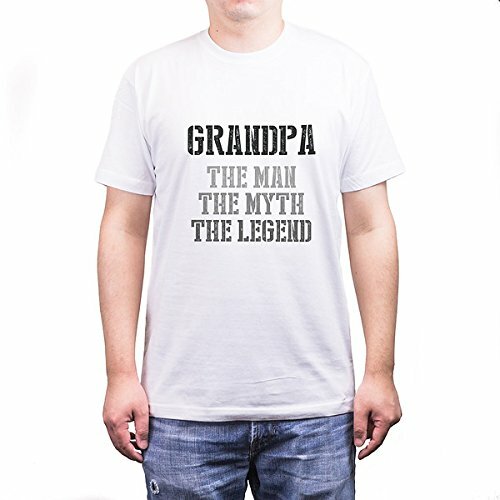 This gift is perfect for the grandpa who has a good sense of humor and enjoys wearing shirts from his grandkids. In addition to being more affordable than other gifts, this shirt is a practical option. 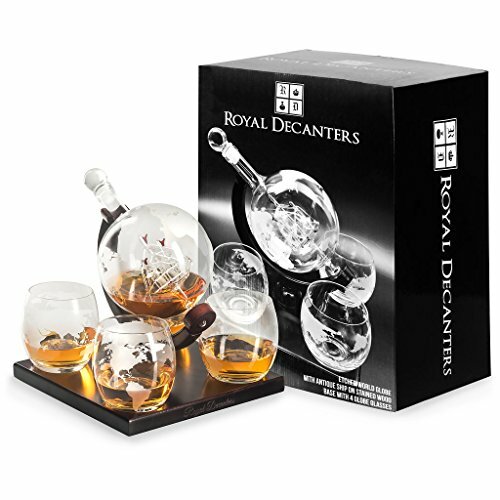 For the grandfather of more refined taste, this beautiful, artisan crafted decanter set comes with a globe style whiskey decanter with a delicately blow glass ship inside and four matching glasses, all of which sit on a hand crafted wood stand. In addition to serving as an aesthetically pleasing piece that will fit nicely in any home, this kit will allow your granddad to enjoy his glass of whiskey in perfect style. The decanter itself measures 850 mL, and the total set with wooden stand measures 12 x 10 x 17 inches. This is a pricier gift, but for the discerning elderly gentleman in your family who enjoys the occasional sip of bourbon, this is the ideal option. 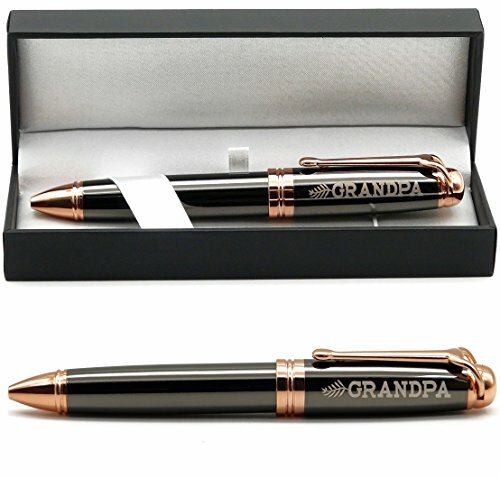 If your granddad is a business inclined individual, or if he appreciates the art of fine writing utensils, then this personalized black ink ballpoint pen might be the perfect gift choice. Each pen is colored a deep gunmetal with rose gold accents and lays in a gorgeous stain-lined pen case. The pen measures about 5.6 inches long, and its presentation box measures 6.2 x 1.8 x 1.2 inches. This gift is a great, simple, and affordable option for your grandpa’s Christmas. If you have younger children who enjoy writing and drawing, this handy and adorable guide is a good choice that will allow your children to express themselves creatively while creating a lasting gift for grandpa. This book is a perfect long term gift that can be designed and added to over the course of time and given to granddad on a special Christmas when it is full of loving letters and designs. Each spiral bound book is made out of high quality cardboard and matte paper with 30 illustrated pages that include blank spaces for your children to fill out. Additionally, the book includes 3 pages of fun stickers. 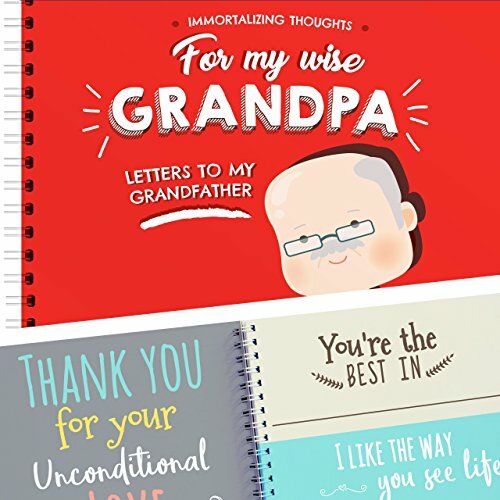 This gift is useful twofold, as it will allow your children to have some fun creating a gift for their grandpa, and it will be exceptionally meaningful for grandpa when you are ready to give it to him. Does your granddad sport a magnificent beard? 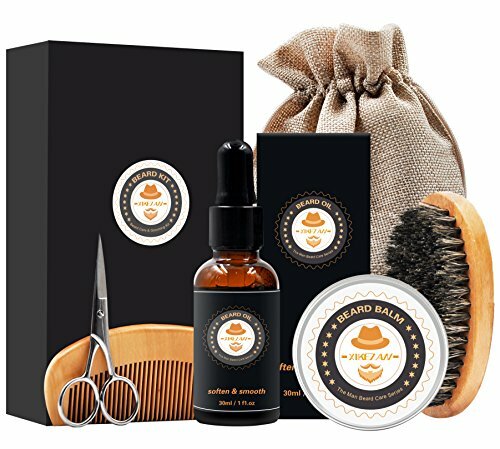 If so, then this beard care grooming and trimming kit is a perfect gift so that he can keep his beard in tip-top shape. There is nothing quite like a well groomed beard and the tools that are used to create that look. You can never go wrong with an excellent massage pad that can help your granddad ease tense muscles and soak in some heat for aching joints. 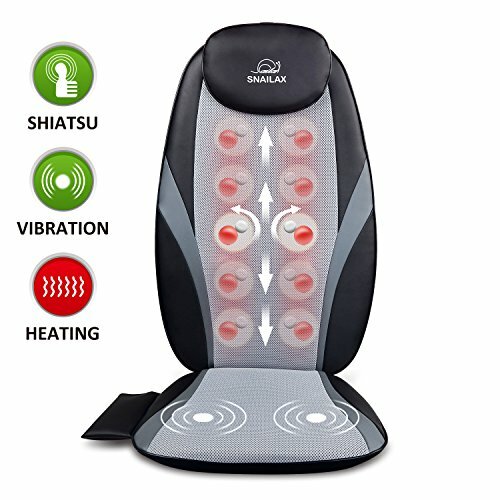 This massager features four shiatsu massage nodes for the back, gentle vibration in the seat of the pad for hip and leg massage, and a soothing, adjustable heat option throughout the pad. The massage chair pad can sit easily on a couch at home or in the car, so your grandpa can enjoy it nearly anywhere. The entire pad measures 26.4 x 5.5 x 18.1 inches and comes with both a home plugin and car adapter. This pad is also extremely easy to operate with its handheld remote control which gives a range of customization options for your granddad’s relaxing massage time. 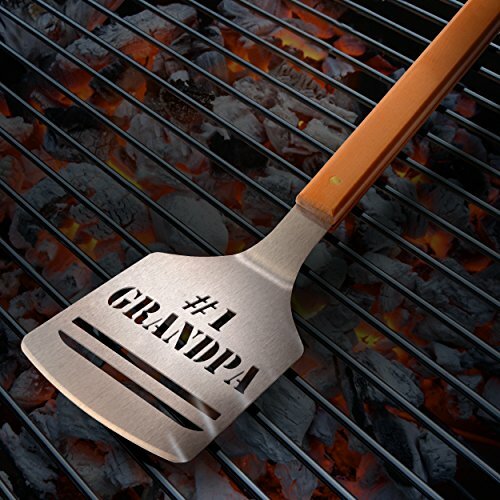 This heavy duty barbecue spatula features the phrase “#1 Grandpa” punched out of the metal of the spatula itself as well as a bottle opener on the handle, thus making this the ultimate tool for the grill master granddad who enjoys popping open a cold beer while he is cooking up dinner for the family. The spatula measures 18.5 x 4 inches and is made with a head stamped hard maple handle that encases the heavy duty metal of the spatula overall. 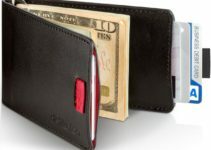 This is a great gift for grandpa that combines familial love, practicality, and high quality product all in one.